Plica polonica is an uncommon condition, in which there is acquired matting, irreversible twisting, and entanglement of hair. It is also called bird's nest hair, plica neuropathica, or felted hair. It was first described by Le Page in a young girl with hysteria. This condition has been reported in religious persons (Sadhus) in India who raise a plica for wish fulfillment. Herein, we report the case of a female with metastatic carcinoma breast who developed plica polonica after docetaxel chemotherapy. This condition has not been previously reported with docetaxel. 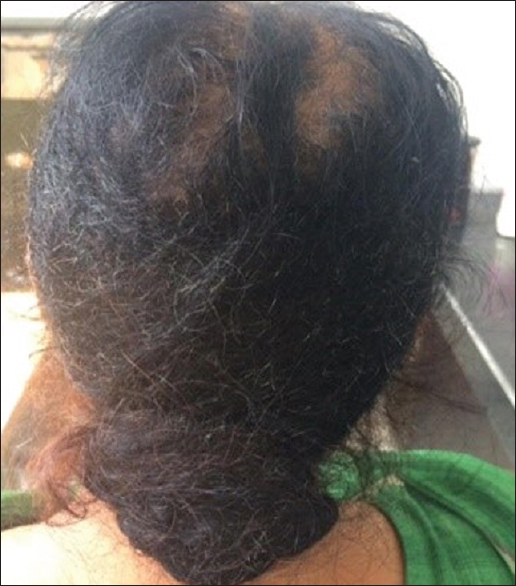 A 63-year-old female, known case of metastatic carcinoma breast, presented with spontaneous matting of hair on the scalp for 2 days. She had received docetaxel chemotherapy 2 weeks before presenting to us. There was no associated pain or itching on the scalp. She had normal hair washing and combing habits. She denied a change of shampoo and had not undergone any chemical treatment of hair. Furthermore, she had not cut her hair for many years. There was no psychiatric comorbidity. On examination, a matted mass of hair was seen in the occipital area along with noncicatricial hair loss in the middle of the scalp extending up to the vertex and in bilateral parietal areas [Figure 1]. There was no erythema, scaling, crusting, or nits. Hair pull test showed easy hair dislodgement. Dermoscopy showed entangled hair shafts. 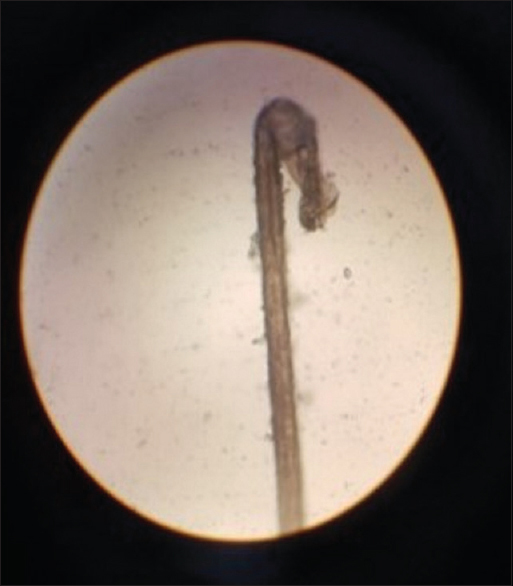 Microscopy showed anagen hair with cuticular damage [Figure 2]. All routine investigations were normal. The patient was counseled about the irreversible nature of the matted hair and cutting of the felted hair was suggested. Chemotherapeutic drugs impair or disrupt the anagen cycle causing hair follicle dystrophy. Immunosuppressive drugs affect hair matrix cells resulting in narrowed or defective hair shaft. Drug-induced cuticular damage may also predispose to hair matting. Thus, anagen effluvium following chemotherapy and drug-induced cuticular changes might have predisposed to hair matting in our patient. The role of lipids and melanin in hair as binding sites for drugs is not clear. Electrostatic bonding between drugs and proteins in hair or drug-induced changes in hair keratin may have some role in the pathogenesis of this condition. This case highlights a rare side effect of a commonly used chemotherapeutic drug. To the best of our knowledge, plica polonica has not been reported previously due to docetaxel. Le Page JF. On neuropathic plica. Br Med J 1884;1:160. Bhatia A, Kanish B, Chaudhary P. Plica neuropathica (polonica). A matter of Faith. Int J Sci Stud 2014;2:91-2. De D, Narang T, Kanwar AJ. Frequent combing as a cause of plica neuropathica. J Eur Acad Dermatol Venereol 2007;21:1283-4. Wilson CL, Ferguson DJ, Dawber RP. Matting of scalp hair during shampooing – A new look. Clin Exp Dermatol 1990;15:139-42. Bogaty H, Dunlap FE. Matting of hair. Arch Dermatol 1970;101:348-51. Dawber R. Matting of scalp hair due to shampooing: A hypothesis as to the cause. Clin Exp Dermatol 1984;9:209-11. Anisha S, Sukhjot K, Sunil GK, Sandeep P. Bird's nest view from a dermatologist's eye. Int J Trichology 2016;6:69-70. Gupta S, Kumar R, Vijay A, Jain SK. Plica polonica in a patient on chemotherapy: A case report with review of literature. Int J Trichology 2017;9:124-6. Ramanan C, Ghorpade A. Plica neuropathica after using herbal soap. Int J Dermatol 1993;32:200-1. Kanwar AJ, Narang T. Anagen effluvium. Indian J Dermatol Venereol Leprol 2013;79:604-12.